THIS IS NOT A SHARE HOUSE AND GROUPS OF HIGH SCHOOL, PROM, GRADUATION, ETC. ARE NOT WELCOME !!! My home offers three bedrooms and a den, three full bathrooms, central air conditioning, and an outdoor patio with gas grill. There is a telephone, WI-FI, and all bedrooms have a television with cable. Kitchen includes all cooking supplies and dining room has seating for at least 8. I provide you with ALL LINENS for the beds, including extra sheets, blankets, and pillows. There are BEACH TOWELS for your use, and a huge laundry room with a front-loading washer and dryer for your use during your stay. I provide you with toiletries, toilet paper, paper towels, napkins, paper plates, plastic cups, ziploc bags, saran wrap, plastic containers, etc.....AND lots and lots of spices (so you don't have to buy a big jar of one of them just because you need a sprinkling of it....) There is even laundry detergent provided for you!!!! My house is a 10-15 minute walk to town and the nearest public ocean beach. You can also drive to the beach and park in the free public parking lot (at Kirk Park Beach). My house is also a short bike ride to the nearest bay and Navy Road Park (aka dog park), if you bring your four-legged family member with you. There are miles upon miles of walking trails for you to enjoy also. The school playground and playing fields are just down the block from the house. You can walk to Ruschmeyer's Resort and Sole East, two of the Hamptons hottest resorts, and other restaurants. My home even has an invisible fence (and collar for your dog to use) if you bring your four-legged family member with you. My house is my family home, lived in during the time that I don't rent. I take pride in how I present it to my families, and live locally, so if there are any problems, I am a minute away. There is a separate phone line for you to use for calls. There are tons of extra sheets, blankets, quilts, towels, bath mats. I also provide the detergent and fabric softener!! Gravel driveway for up to 4 cars. Any additional cars can park at the school, just down the block. One spacious living room and also a small den. I provide spices, cooking spray, oils, and various other things so you don't need to bring a lot of items with you. I provide you with paper towels, dish soap, baggies, saran wrap, paper products, spices, and lots of pots, pans, and bakeware to choose from. There is a counter in the kitchen for at least 4 people. Seating is for at least 8 people, and there are two high chairs for you to use. There is also seating at the kitchen counter for at least four people. Books both downstairs and in one of the upstairs bedrooms and hallway! Lots for kids to play with!! Lots of children and adult movies!! And soccer balls and footballs to play with! At least two adult and two childrens' bikes!! Front porch has two rocking chairs. With Patio table for at least six people! This house was incredibly clean and accommodating. It's super close to town! This home was perfect! Clean, great location, stocked with essentials and easy as can be! Thank you! We had a wonderful stay. The house was very clean with many amenties. There was even a bottle of wine welcoming us! We had an excellent trip and would love to stay here again!! Everything you read in the description of this house is true. It is comfortable, beautiful and really includes all the amenities listed. We have been coming to Montauk for many years now and have rented a number of different homes. Gail's house is, by far, the best in many ways. Our usual beach is Hither Hills which is super quiet so we were uncertain about Kirk Park Beach. We were pleasantly surprised by how nice it was. And unlike in Hither Hills, we could walk into town for supplies, to kayak on Fort Pond, or to go for lunch before heading back to the beach. Gail could not have made the process easier. We hope to be back! A beautiful and spacious home! My wife and I with our 3 adult children had a fantastic stay at Gail's beautiful Montauk home. Gail's attention to detail and amenities was unbelievable. From the first steps into the home we felt so welcomed. It was like staying at a 5 star hotel! The house was close enough to walk into town but far enough away to enjoy the serenity of the tree lined neighborhood. 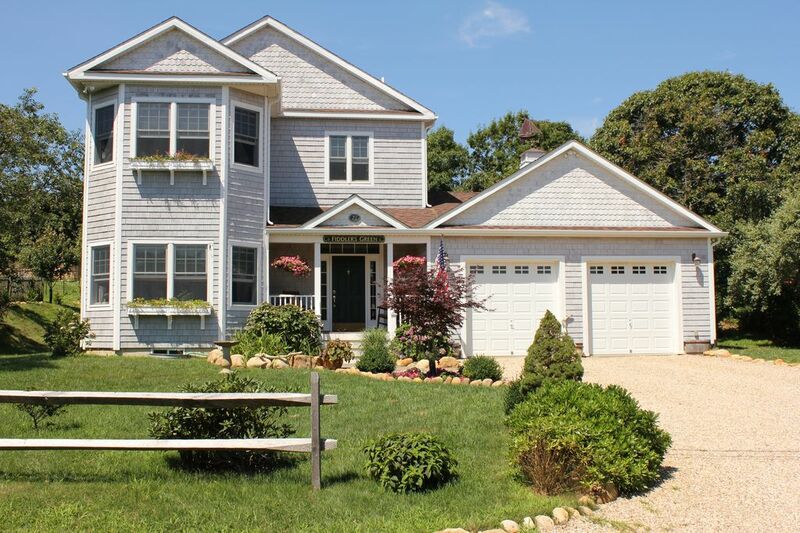 We recommend this rental for families and or couples looking to enjoy the Montauk experience! We have been renting this beautiful home since the summer of 2013. We absolutely love it and highly recommend this home. We are 3 generations and having a bathroom for each family (3) is a very big plus . You couldn’t find a better owner than Gail Herbert. She is generous, helpful and so accommodating. Her home is lovely and well maintained. The spacious layout gives everyone enough options for privacy , when needed. We have stayed in many types of accommodations in MontUk over the years. Gail provides many suggestions for activities and dining. The choices are plentiful and top notch. I just hope that the great reviews don’t affect our ability to continue to enjoy this wonderful home. My home is located in a quiet neighborhood, just a short walk to the nearest ocean beach or town. For the beach, I have two beach carts, a wagon, lots of beach chairs, boogie boards, sand toys, etc. There are Tonka trucks to use at the beach or in the gravel driveway. KIRK PARK BEACH: The closest ocean beach to the house. There is a free public parking lot for you to park, and the drive is about 2 - 3 minutes, or you can walk in about 10 minutes. TOWN BEACH: Off Main Street, by The Sloppy Tuna Restaurant. There is no parking lot, but you can legally park on the side of road there. DITCH PLAINS BEACH: Off Ditch Plains Road, and unfortunately, you need a town permit to park here. Great surfing there!! SOUTH LAKE DRIVE: Off Montauk Highway about one mile west of town. This very small beach is at the southern end of Lake Montauk. Depending on the tide, it is a great beach if you have small children, though not a good beach is the tide hasn't moved some gook out of the harbor. You need a parking permit to park here. PUBLIC POOL: The Montauk Downs State Park (a 10 minute drive) offers an Olympic-sized swimming pool as well as a toddler pool. There is a snack bar and lots of pool loungers and chairs to use. PLAYGROUND & PLAYING FIELDS: Just down the block, at the public school, there are playing fields, a basketball court, and a great playground. GOLF: Montauk Downs State Park golf course is rated one of the top 20 public golf courses in the nation. Play 18 holes, or just hit the driving range or putting green. TENNIS: There are free public tennis courts in Montauk town, and also additional ones on West Lake Drive. Montauk Downs State Park has tennis courts as well. WAVERUNNERS: Uihlein's, in the Montauk Harbor (a 10 minute drive), rents waverunners as well as boats. PADDLEBOARDING: There are quite a few surf shops that rent paddleboards (as well as bikes....though I have bikes for you to use)!!! SEAL ROCK: About ½ mile before you get to the Lighthouse on the left side. You can park across the street before as you enter the residential neighborhood of Camp Hero. You cannot park on the side of the State Road. CAMP HERO: Just before you get to the Lighthouse, on the right side, there is an entrance gate about 50 yards up the side road. Great trails inside what used to be an Air Force Base. You can see the underground bunkers (can’t go in them), the now decommissioned Radar Tower, walk along the cliffs. Very very pretty !!! NAVY ROAD: On the Long Island Sound, there are miles and miles of trails that are beautiful, but you should bring a map, as it’s very easy to get lost!!! There is a HUGE field for your dog to run around here also. MONTAUK CLAM & CHOWDER HOUSE – 470 West Lake Drive – great sushi and local fish dishes. SWALLOW EAST – 470 West Lake Drive – Tapas sized portions. You can sit on the patio which overlooks the fishing boats….GREAT FOOD!! THE DOCK – 1 Montauk Harbor – Also located in the Montauk Harbor area. If you like mussels in white wine sauce, you MUST go here! It’s a local favorite that’s been around for years and years. They have GREAT mussels, GREAT burgers, and GREAT specials. THE INLET CAFÉ AT GOSMANS – 500 West Lake Drive -- OUR FAVORITE -- a hidden gem. It is in the Gosman's complex (at the Montauk Harbor), behind the snack bar. They have a great menu (try the steamers and fried calamari) and offer sushi also. You can sit right on the water and watch the boats go in and out of the harbor. THE INLET RESTAURANT – 541 East Lake Drive - at the end of East Lake Drive. Good food (seafood), sushi, great sunset views. THE HARVEST ON FORT POND – 11 South Emery Street - great restaurant. Very large dishes that can easily be shared. It is very crowded so I suggest making reservations a few days in advance.